If you didn’t catch the giant inflatable pop-up chapel/igloo at Silver Lake’s Materials & Applications gallery last year, now’s your chance to experience it in person. Well, it’s cousin anyway. The 25-foot-tall second rendition, Density Frames was designed by USC’s architecture director Gail Peter Borden for the school’s Religious Center courtyard. 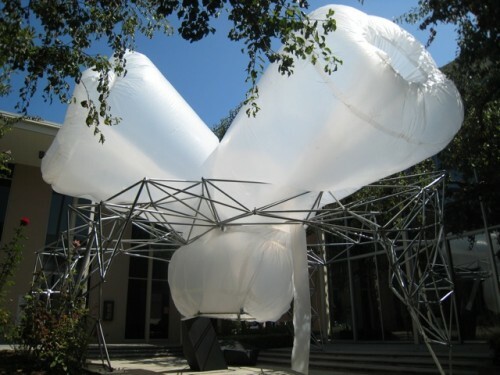 The irregularly-shaped balloon-like structure will be on display through December 15. The project was fabricated by Borden and four other students over four weeks at a cost of $1,000. The exhibit is free and open to the public daily. A map of USC University Park campus can be found here.